Sea salt drives me bonkers. It is too big for the salt shaker holes and very little comes out. Give me Mortons. A lot of people use to have goiters before iodized salt came out. Same thing with a lot of gluten free products. I heard Cap'n Crunch is a cereal killer. I think it is a george orwell way of saying to update and recycle. Your not recycling or updating but a combination of both. Another new word is "Uptalk". It describes kids, usually young girls, who make every statement a question. Example- I like driving my car? Why is that a question. It drives me crazy. P.S. Sea salt. environmentally grown food, organic mic connectors? I'm not going into a discussion about Global Warming, but it has become the new marketing tool. You pay extra for a green sticker on your appliance. How much carbon dioxide is you're new washer putting in the air? $! That is what puts the green in green. Terry as to the question "how much carbon dioxide is your washer putting into the air", I would guess it depends on first, how do you heat your water, gas or electric and where your electricity is generated? Unless your getting your electricity from hydro electric/ wind farm or solar you have CO2 generation. If you have a natural gas water heater, enough said. Meat and energy. Both seem cleaner when you can't see them being made. You are right 75. Which I guess brings me to the question as to how a subject such as "More worthless terminology" can bring so much interest? I like to talk radios etc. Guess it has been a slow month. jerryhawthorne wrote: Terry as to the question "how much carbon dioxide is your washer putting into the air", I would guess it depends on first, how do you heat your water, gas or electric and where your electricity is generated? Unless your getting your electricity from hydro electric/ wind farm or solar you have CO2 generation. If you have a natural gas water heater, enough said. Damn, I knew I should have put that sarcasm emoticon in. Jerry, start up a thread on what you would like to discuss. I'm sure there are folks here who will join in. It might take as much as a few days til everyone checks in, but that's how you get the discussions going. Give it a shot. I know you have ideas that are interesting, put them out on the showroom floor. I started this thread as a tongue-in-cheek expression of exasperation from an old dude like me who is admittedly out of touch with the 21st Century. Kind of like doing my part to enhance the "generation gap", a thing that I SWORE to my grandpa that I would NEVER do. He assured me that I most assuredly would, since he had made that same vow himself. There have been several threads on TRF that have had nothing to do with radios, per se, but have had lots of interest. That is one of the features of TRF that I especially appreciate. We get into each other's interests. We all jump in and share our thoughts. I am almost finished with my current record player restoration project. I have posted pictures and people have chimed in as they see fit. I am starting another project with a Magnavox Collaro L-600 changer than I am going to start a thread on soon. My Concert Grand project will start in the Spring. I have my Halli S-110 to finish when I get back home. These may not be radios, per se, but there has been lots of interest. 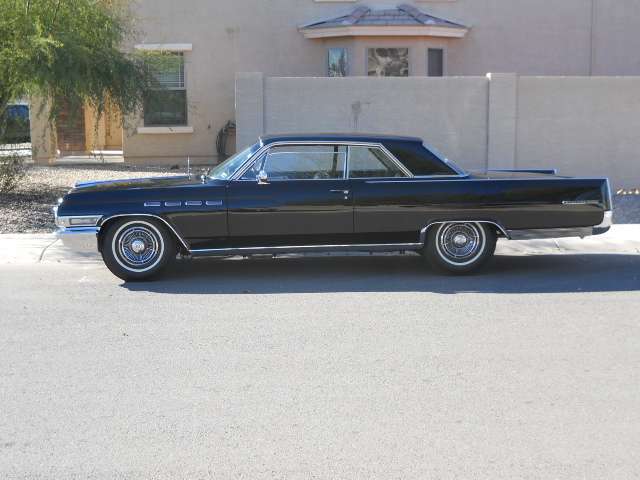 I am taking this week off from electronics projects to get the Buick ready for the cruise-in following the Barrett-Jackson auctions in Scottsdale. Hopefully, Bill will have a project ready to share in the near future. Gang, sorry if I came out bad. WC, I would be a lot more interested in your trip to Scottsdale. I like to learn about all the electronic/mechanical aspects. I have been out of projects for about a year, just a mental issue and hard to focus on things like schematics but have a bit of knowledge to help people. I have a couple of radios to take out to CA. to work on in the condo to see if I can regain the desire to actually work on them. I enjoy trying to help people with repair, not too good on cars but have restored a couple of early Mustangs and a 911 Porsche. I enjoy threads of people working on radios and need help. Not that I'm much help. Jerry, you were honest about things and that is the right thing to do. I have to move around to different things also as I burn out on just one aspect. Maybe electronics a little more than most because I still am working in it. I have recently bought an old phone that I am putting into shape to use with my VOIP service. On the Saturday after the Barrett-Jackson classic car auction, there is a cruise-in at the "Rock and Roll McDonalds" the oldest continuous collector car cruise-in in the Valley certainly, and maybe anywhere. I have been going there for probably 20 years. They have a permanent DJ who plays 50's and 60's rock and roll music. There is normally a couple hundred cars there on a typical Saturday evening. After B-J, there is always over 1500 cars, last year nearly 1700 were there. They took up the Home Depot parking lot, much to the chagrin of the H-D people. The only kind of cars not present are tuners. Those little cars with turbochargers sticking out where the hood normally is. Last year they even had military vehicles there. I got there last year at 5 am to get a parking spot for a show that officially starts at around 4 pm. The frau drives up in the afternoon and mooches supper out somewhere. It is a good time if you are a car guy. Several of my old car buddies are going to be there, and that's about the only time I get to see them. Here is a picture of my Buick. If all goes well, and I don't have to push the thing to Scottsdale, I will be there on Saturday. Our "cruise" back in the early 60s in the San Fernando Valley in CA was through the Bob's Big Boy. A line went for a block or so and cars were allowed in when there was parking. Most just waited for a chance to drive real slow through to show off their iron and be seen. The GM cars would then park around the GM dealer close by, the hearse cars and yes there were a lot, parked in front of the close by mortuary. No organization whatsoever but things just worked out well. The good old days. I would cruise in my 50 ford business coupe with two 97 carbs and fenton headers with three on the tree and overdrive. I had a buddy in high school whose dad was a deputy sheriff. He got an old cop car, a '58 Bel Air 2 door hardtop, with a 348, three deuces and Powerglide. It even had PS and PB, which was really deluxe for a Chevy. Another buddy had a '62 Ford Galaxie XL with a 390 and three on the tree. That Ford would burn rubber longer than any car I have ever seen to this day. I could not really burn rubber in my Buick, and Kenny was too cheap to burn his tires up on the Chevy, so we let the Ford guy impress everybody. He was pretty much king of the roost until a guy named Granny came to town with a '62 Plymouth with a 413 with cross ram 4 barrels. Our local cruise spot was the Dog 'N Suds. All the cute females worked there. The local cop hung out there to keep us out of trouble. He had a '61 Ford with a six and three on the tree. The slowest cop car ever built. A kid on roller skate could outrun it. That is one beautiful Buick. My Uncle was a salesman at a Buick dealership. He always had a company car which was always a new Buick. I learned to drive on brand new Buicks. My Uncle liked to get convertibles and I loved when he would send me on an errand in his Buick. I always took the time to make sure all the young girls saw me driving it. Those were the days! I owned 2 Buicks myself. A 1965 Riviera and a 1972 Skylark 2DRHT. Another buddy had a '62 Ford Galaxie XL with a 390 and three on the tree. That Ford would burn rubber longer than any car I have ever seen to this day. Those "FE" engines had a lot of torque! When I was young and dumb I started one sitting on the garage floor to show it to my friend before putting into my '64 Galaxie. I gave it a little gas and it flipped over and smashed the carb! I had to laugh at your firing up that engine setting on the floor Mezlaw! Yup, you must have been young and dumb. In 1962 the place I was working for the summer a friend bought a new Plymouth with two cross firing 4 barrel carbs. It was basic with only option an auto transmission. The dang thing would break the tires loose on starting cold with the choke on and a relative fast idle when he let off the brake. Must have been a scary fast car. That '62 XL with the 390 was equipped with O/D, so it had a really low-geared rear end. The thing would pull stumps when it was not in overdrive. You could brake torque that thing and burn the rear tires down to the lug nuts. It had skinny little 14" tires on it, and, man would those things smoke! The '62 Plymouth that Granny Norris had was a pretty ugly car, but it was scary fast. All it had was a 413 with crossram intake and a pushbutton Torqueflite transmission. It drove and rode like a dumptruck. A FAST dumptruck.! Most of the cop cars of the day were either 410 Mercurys or 383 Chryslers. He could run off and hide from either will no problem whatsoever. jerryhawthorne wrote: Gang, sorry if I came out bad. WC, I would be a lot more interested in your trip to Scottsdale. I like to learn about all the electronic/mechanical aspects. I have been out of projects for about a year, just a mental issue and hard to focus on things like schematics but have a bit of knowledge to help people. I have a couple of radios to take out to CA. to work on in the condo to see if I can regain the desire to actually work on them. I enjoy trying to help people with repair, not too good on cars but have restored a couple of early Mustangs and a 911 Porsche. I enjoy threads of people working on radios and need help. Not that I'm much help. I'm having the same problem about working on radios. It's a mental thing too. I can't seem to get going. In fact I just sold a bunch of tubes on eBay. I have a chairside radio that needs a new 6E5 and grill cloth plus a GE AM/FM that needs a tube and changer restoration. Maybe it's the weather. I have been making vintage mic cables for Shure microphones. They're selling like mad and they keep me busy. I did get a new lighting system for my photography studio. Now I just need some subjects besides the animals. You ought to put out an ad and take ebay and craigslist pics for people. Charge for the service, they bring their own media. Actually I've started specializing in animal portraits, both inside and out. I made $50 on one 2 hour session. The problem is that because of the weather the dog park, and my potential customers, have disappeared. I would love to do some head shots but you can't just go up to a girl anymore and ask to take their photo. I tell them they can bring their boyfriend. I'd do it for free just for the experience. Once again it's a weather thing-nobody wants to stay and talk. Hopefully things will change. One day I'll post some photos here. Wonder if you could work a deal with one of the big pet supply centers to do pictures in their locations?